Hi everyone! It's Lauren from Perpetually Chic. Quick show of hands: Who is guilty of skipping breakfast? When you're dashing out the door in the morning to work, school, or to drop the off kids, breakfast can be the last thing on your mind. Yes? 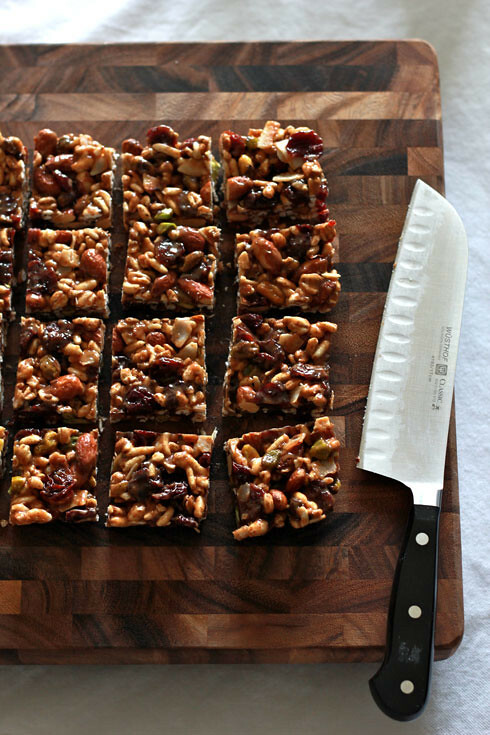 It happens more often than I care to admit, but these breakfast bars are my new time-saving trick. Just whip up a batch over the weekend, and you're set for the week. Keep reading for the recipe--no baking required! 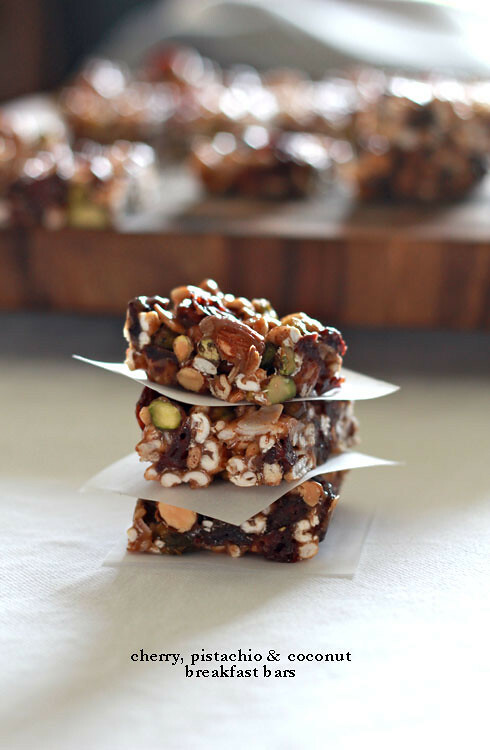 To be clear, these bars are packed with some healthy ingredients like raw almonds, pistachios, and dried cherries. 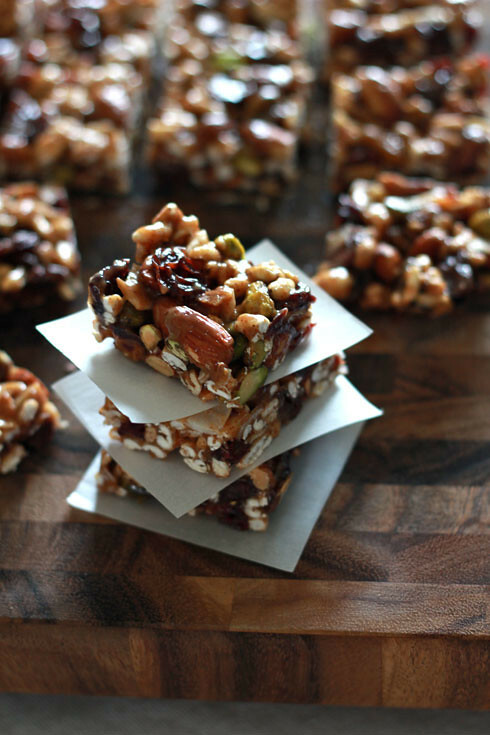 And while they may be better for you than many store-bought granola bars, they're certainly not free of sugar. 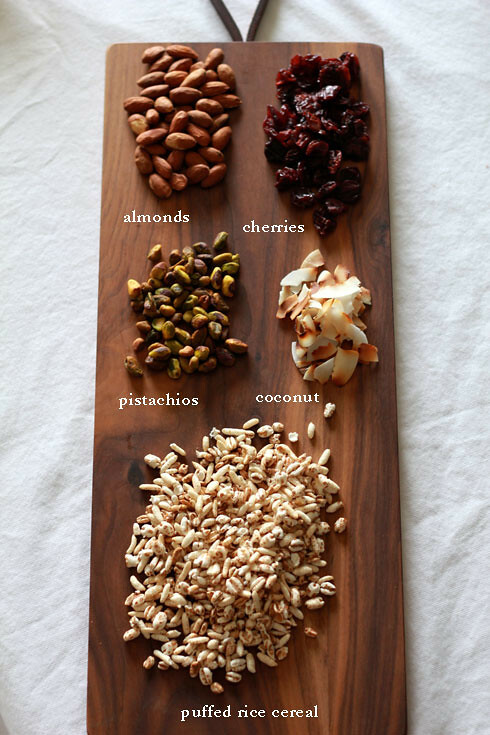 I used almonds, pistachios, dried cherries, and toasted coconut flakes for my fruit and nut mix. You can also change things up using this same basic recipe--try dried cranberries and walnuts or dried apricots and cashews instead. These bars do have a tendency to stick together, so be sure to layer parchment paper in between the cut squares when you store them. 1. Line an 8-inch baking pan with aluminum foil. Leave a few inches overhanging. Grease with 1 teaspoon butter. This allows easy removal later. 2. 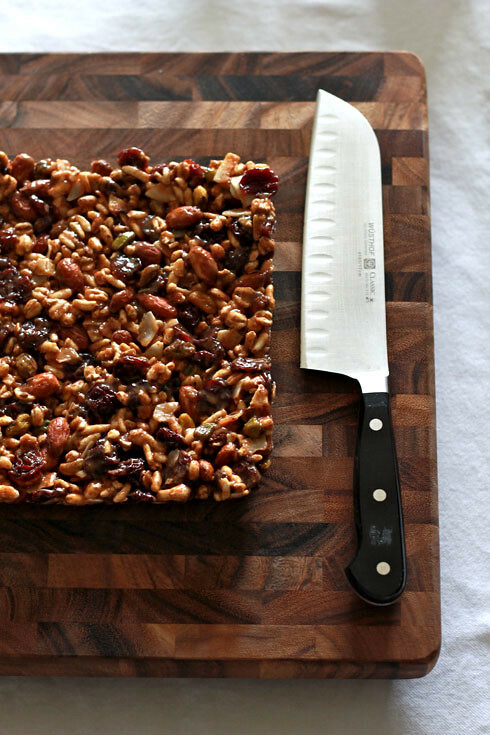 In a large bowl, combine cereal, nuts, cherries and coconut flakes. 3. Heat a saucepan over medium heat. Stir together brown rice syrup, almond butter, brown sugar, salt and 2 tablespoons of butter. Mix until smooth, allowing to simmer and cook just a minute. 4. Immediately pour the hot mixture into the bowl with the cereal mixture. Use a wooden spoon to mix everything until evenly coated. 5. Pour the mixture into the pan. Press the mixture evenly with your hands. It will be very sticky! Refrigerate the bars in the pan about 1 hour to set. 6. Lift the foil to remove the bars from the pan and transfer to a cutting board. Using a sharp knife, cut the bars into 2-inch squares (small bars). 7. 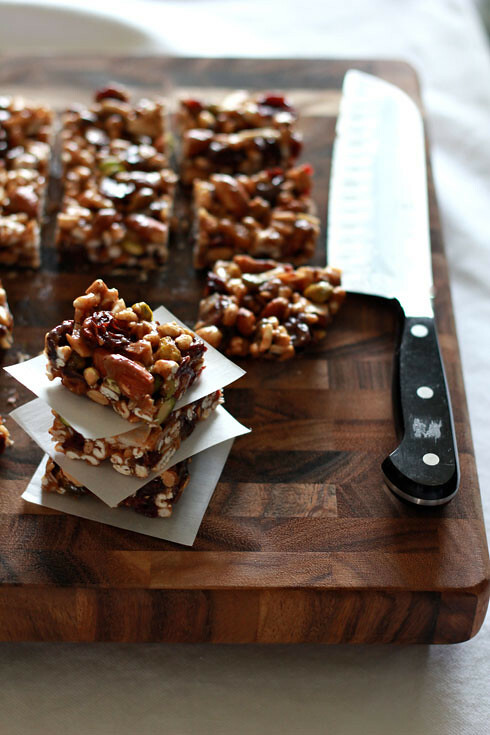 Place the bars in an airtight container with sheets of parchment paper in between each layer of bars. Store in the refrigerator for a week. this looks so yummy! I will definitely be trying! These look fantastic!Cannot wait to try, thanks Lauren! This has every ingredient I love the most in granola bar recipe anywhere, all together now in one bite. Seriously, I can't wait to create this myself! This has every ingredient I love from any granola bars I've had, now all together in one bite. Seriously, I can't wait to make this at home! Thanks for sharing. These look great, super healthy! Do you think I could substitute the brown sugar with honey?